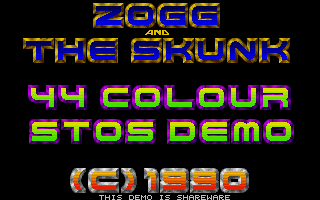 DEM.434C The Big STOS Demo by Captain Zogg and The Skunk. 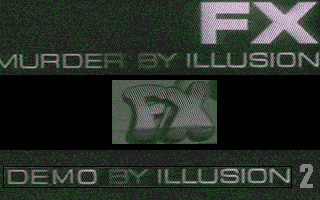 Features a title screen in 44 colours, five sub-demos (press 1-5 to access these) and several different pieces of music and a VERY fast scroller. DEM.687C The STOS Blipp Demo by Escape. 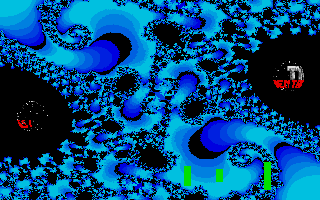 A collection of six sub demos which are all written in STOS Basic (source code on disk!). Your ST has not bombed,it's all part of the demo! DEM.735C The STOS Demo Collection by Storm. 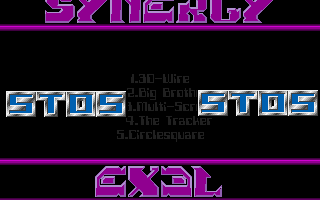 An intro followed by six demos created using STOS Basic. You'll never believe it's STOS! 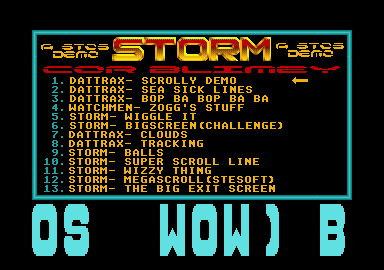 DEM.821C The Cor Blimey Megademo by Storm - Features 13 excellent sub demos all written in STOS! Needs a joystick to operate the main menu. Not STE. 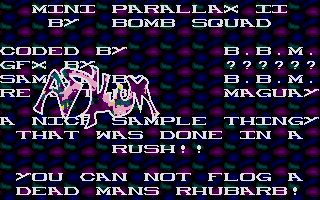 DEM.868C RETINAL BURN by The Asylum - A nine part mega demo written in STOS. 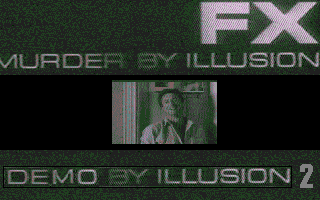 The effects achieved make this one of the best STOS demos. 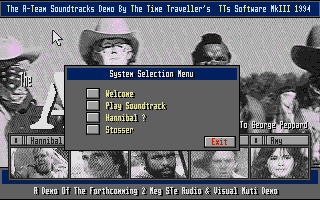 One of the demos even formats your disks and installs one of half a dozen custom bootsectors onto it! 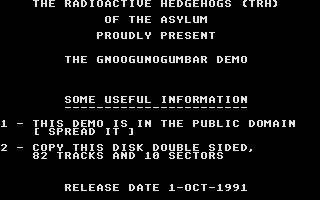 DEM.869C THE GNOOGUNOGUMBAR DEMO by The Radioactive Hedgehogs - An impressive 11 part mega demo written in STOS. Once again, you'd never know it was written in STOS! Don't access the squibbly screen until last. You'll know why if you try to! 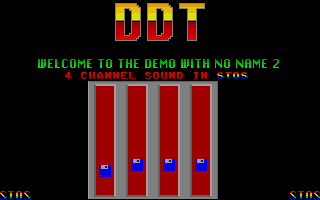 DEM.871C THE DEMO WITH NO NAME by DDT - A three part STOS demo which features 4 channel soundchip music, wierd samples with pictures to match and three excellent soundtracker MODs. 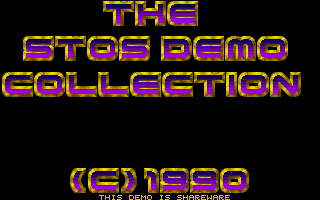 DEM.896C THE CUNNING DEMOS by ACO and Flair - An impressive collection of around 20 demos written in STOS with contributions from all the best STOS coders including STORM and The Happening Bz. Drive your car along a track avoiding obstacles as you go. 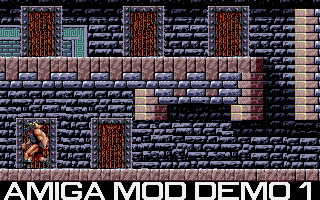 Press Space as you pass over the name of a demo to enter it. 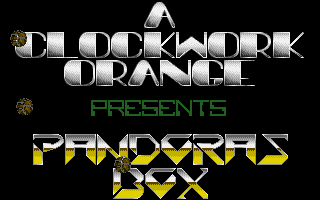 DEM.3083C PANDORA'S BOX by ACO - Written for the 1st Scottish Computer Fair in Glasgow in December 1991. 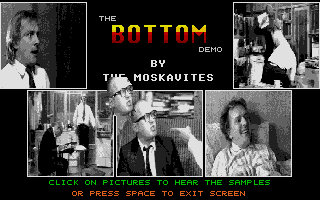 A collection of eight demos and a game. 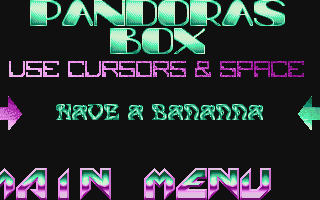 All were written in STOS and several feature smooth parallax scrolling and one has over 30 colours on screen. The game involves tracing your way around the bends of a wire without actually touching the wire. If that sounds complicated,give it a go,it is! 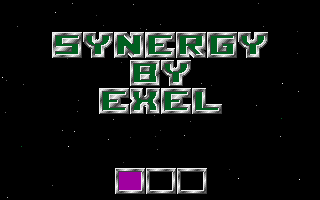 DEM.3291C THE SYNERGY DEMO by EXCEL - A five part demo created entirely using STOS Basic. 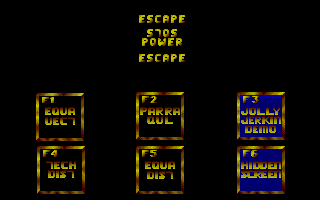 Select the demos by using the keys 1 to 5 from the main menu. Good standard for STOS Basic. 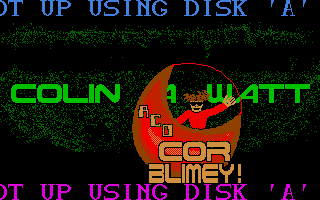 Includes full source code on disk. DEM.4298C VARIOUS DEMOS - A collection of four totally unconnected demos from several different coders. 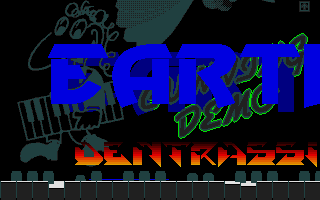 DRACULA - The first ST demo from a French coder known as Dracula. 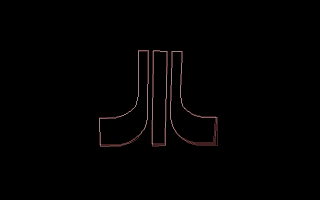 It is fairly simple, starting with a spinning wire frame Atari logo, progressing to a spinning three dimensional block. A voice yells at you, then an egg pops out of the box. 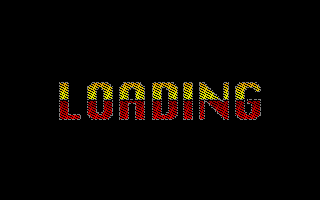 JOSEPH'S HOLIDAY by Wacko Software - This demo was created with STOS and Kozmic and has two scrollers, chip music which can be changed using the function keys, and lots of colours cycling rapidly, which can make reading the scroller a problem! 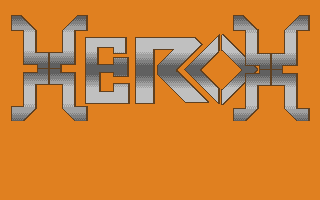 The last two demos are animations created with Lexicor's Chronos 3D. FLUTTERA - A butterfly which flutters around the screen with its shadow over the ground reflected by a wireframe lamp. LOWMORPH - A 3D wiremesh face forms out of a series of straight lines. Both animations show the power of this new force in ST graphic animation. 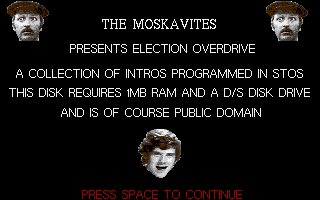 DEM.4795C THE ELECTION OVERDRIVE DEMO by The Moskavites - A collection of screens spread over two disks. Everything is written in good old STOS and there is only one screen which has a scroller (a welcome relief!). The screens all follow on each other, just press Space to move on. The only one this doesn't work for is the fractals screen which cannot be exited (you have to wait until it has finished). One of the screens involves clicking the mouse over a number of pictures in order to listen to various pieces of digitised speech. There is also a screen with a sample and picture of John Major! 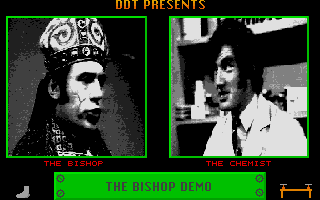 The rest of the demo has a couple of 512 colour pictures and a combination of chip and sampled music. Stereo sound can be sent out through the STE stereo jacks or to a stereo cartridge or via a sampling cartridge to your Hi-Fi on an STFM. 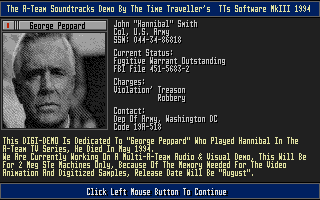 Be ready to swap the disks when prompted, otherwise the demo will terminate (you don't get long!). This two disk demo is an example of what is possible with STOS from one of the smaller coding groups. Needs 1 Meg. 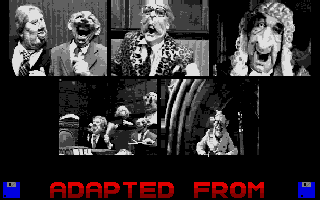 DEM.4981C THE DELIRIUM DEMO by Orbital Software - A six screened STOS demo.Choose which of these screens you wish to view by using the arrow keys. 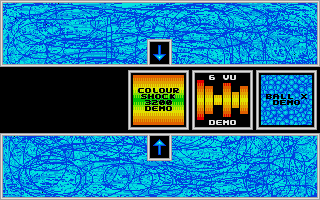 They include a colour shock, large moving balls, four scrollers at the same time, and some chip music which is played along with moving graphic equalisers. 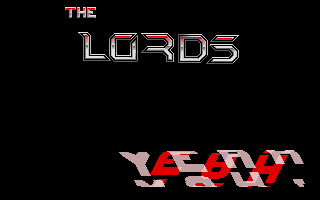 DEM.5648 THE LORDS - A collection of five standalone STOS demos by a French crew. 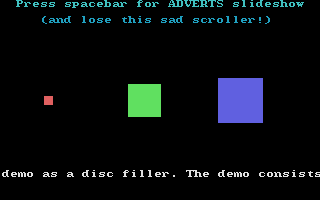 These demos are more of an advertisement for STOS than anything else as they demonstrate scrolling text presented in various ways. Well presented with nice graphics. WILDFIRE DENTRO - A dentro is a small demo and this is one of the more impressive ones. 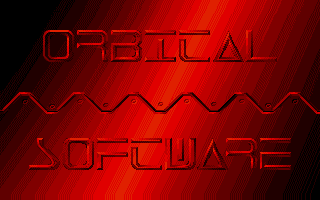 It features stunning graphics, as well as a flapping Atari logo created from small different colour balls. 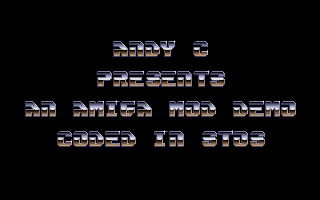 The credits are given using a Star Wars type scroller which is one of the best examples of this type of scroller to date. Short but sweet and well worth seeing. STE ONLY. DEM.4948 & DEM.4949 THE STOSSER DEMO by Martin Cubitt and Friends - A two disk selection containing thirteen small demos by regular contributors to the STOSSER diskzine. 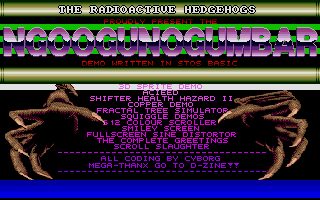 Demos include a tracker screen, a demo based around the Rainbow star, Zippy and a collection of mandlebrots. Other screens have lots of scrollers, music and graphic effects and all are coded in 100% STOS.A great example of what you can do with STOS if you really put your mind to it. 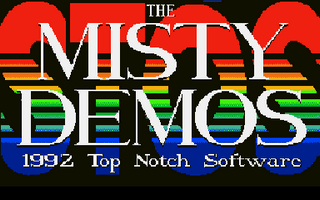 DEM.3474C THE MISTY DEMOS by Top Notch Software - This demo was created by ACO and Whee The Fibble to show off their new Misty extension for STOS Basic. There are two menus, the normal one and the easy one. Swap between them by pressing the Help key. There are nine sub demos, all of which demonstrate the graphic capabilities of the Misty extension. The sound's pretty impressive too. 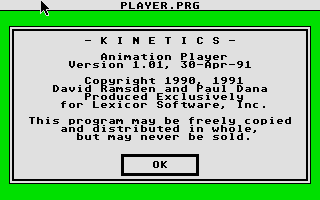 There's also an installer program for putting the extension onto your STOS Basic and Compiler disks. 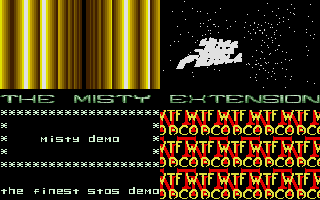 Just one word of warning, demo 3 doesn't run on machines with more than 1 Meg. 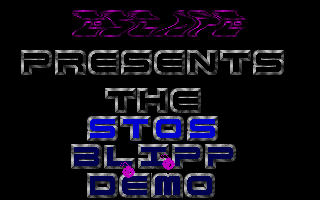 This is the best STOS demo written to date (Dec '92) and will be hard to beat. I'm not just saying that because Floppyshop got a mention in the greetings, either! Tracker Demo by AndyC (no source).